Earning three victories from the three Prestige class finals at round two of the FIM SuperEnduro World Championship, Colton Haaker has moved to the top of the SuperEnduro series standings following a perfect night on the technical track in Reisa, Germany. With the event marking the mid-way point of the championship Haaker’s overall event win moves him 22 points ahead of Spaniard Alfredo Gomez in the championship standings. Despite wet and rainy weather at his home in California hampering his preparations for the second round of the series, Haaker carried his good form from the opening round of the championship in Poland into the Reisa event to master the technical track and come away with three impressive final wins. Enjoying his largest margin of victory in the night’s opening race, Colton battled his way to the front in the reversed start order second final to claim a near six-second advantage before rounding out an impressive night with victory in the third final. 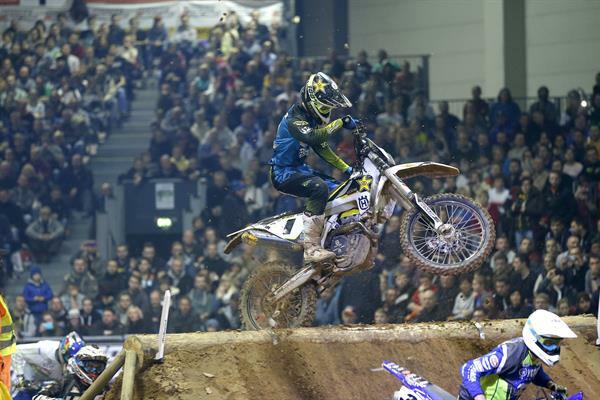 The second round of the SuperEnduro series also proved to be a positive one for Haaker’s team-mate Pascal Rauchenecker. Fifth overall and just two points behind fourth placed Mario Roman, Pascal delivered a much-improved performance over his first ever SuperEnduro outing in Poland back in December. Placing fifth in the first and third finals the SuperEnduro rookie claimed a solid fourth in the second final having lead the race for five laps. The FIM SuperEnduro now takes an eight week break before round three takes place in Bilbao, Spain.